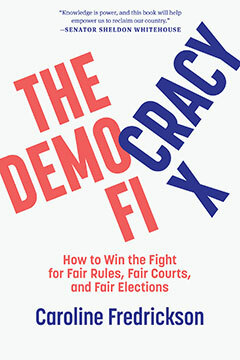 Now, in a sensational new book, Caroline Fredrickson—who has had a front-row seat on the political drama in DC for decades while working to shape progressive policies as special assistant for legislative affairs to President Clinton, chief of staff to Senator Maria Cantwell, deputy chief of staff to Senator Tom Daschle, and president of the American Constitution Society—argues that it’s time for progressives to focus on winning. She shows us how we can learn from the Right by having the determination to focus on judicial elections, state power, and voter laws without stooping to their dishonest, rule-breaking tactics. We must be ruthless in thinking through how work to change the rules of the game to regain power, expand the franchise, end voter suppression, win judicial elections, and fight for transparency and fairness in our political system, and Fredrickson shows us how.